Cardi B has pulled out of her tour with Bruno Mars in the autumn. The rapper says she "underestimated this whole mommy thing" and isn't ready to leave her baby. 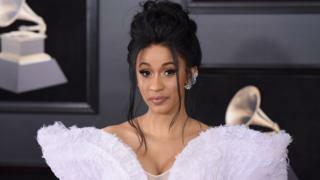 Cardi became a mum on 10 July when she gave birth to a baby girl with her husband Offset from Migos. The 25-year-old was due to join Bruno Mars on tour for 24 dates across North America on the final leg of his 24K Magic tour. She made the announcement on Instagram. "I thought that after giving birth to my daughter that six weeks would be enough time for me to recover mentally and physically. "I also thought that I'd be able to bring her with me on tour, but I think I underestimated this whole mommy thing." Bruno Mars and Cardi B collaborated on the song Finesse. She says pulling out of the tour has has been a really hard decision for her and hopes her fans will understand. Bruno Mars has responded on Twitter supporting her decision: "The most important thing is you and your family's health." He added: "We love you Cardi and we will play Bodak Yellow every night in your honour. "Please give your baby girl a hug from me and a hug on behalf of everyone on The 24k Magic Tour." Cardi B, who is from New-York announced Kulture's birth on Instagram on July 11. Kulture is Cardi B's first child but the fourth for 26-year-old Offset. The couple married in a secret ceremony in September last year.